His death diminishes us all. He was 26 years old when he committed suicide in the face of a prosecution that would have branded him a felon, put him in prison for years and taken away every penny he had – reputedly, the fines, if he had lived would have run into the millions of dollars. What was so heinous? Did he kill someone? Did he cheat elderly people out of their life savings? Did he commit fraud that threatened to destabilize the economy and thrown thousands out of work? Did he take someone’s home? No. He did not. If he’d done any of these, the sentence might have been lighter. In some cases, if past history held true, he might have received money from the government or a bonus from his employer. No. Aaron’s crime was much more heinous – at least in the eyes of the prosecutor that pursued him and the society that let him. He revealed information. He posted it on the web for all to see and share. Why did he do this? For profit? No. He made no money doing this. He charged nothing. He took nothing for it. For revenge? No. He hurt no-one with its release. He had no ill intent towards the owners of the information. In fact, they actually asked the prosecutor not to pursue the charges. For thrills? No. It was a surprisingly unremarkable “hack” that got him the information. He did it in full view. Then why? Why would anyone do this? Here’s the shocking answer. He did it for principle. Aaron was, as always, in pursuit of the goal that the information should be free and open. Access to information was an inalienable right. Did he break the law? Was he guilty? Actually, one could make a credible argument for his innocence. His lawyer did. The fact that he had the right to use the facilities he used could certainly be argued — curbing the idea of illegal use of resources. Could there be any real theft when the owners of the information refused to press charges — indeed they begged the prosecutor to drop the charges. Did he fully understand the consequences of his actions. Actually, I think he did, to the degree that any 26 year old can! He was, after all, a genius. He was of legal age. As I write this, I am thinking of the many, many idiotic things I and my friends did in our early teens and twenties. And I am glad that somehow I and others never had to pay as fully for our transgressions. And I am struck with profound sadness not just for Aaron — but also for his father, who lost a dear child not much older than my own children. Let’s be clear. This young man committed suicide. But he did so in the face of a relentless prosecution, a heartless and unyielding pursuit, without mercy, without compassion – a cold and heartless pursuit. And since his death, I am struck by the image of that pursuit. In my mind I see it – time and again. I see the image from the movie the Matrix. I see merciless and cold face of Agent Smith in his single minded pursuit of the character Neo in the the Matrix. Only in this version – Smith wins. Neo dies. In this version the matrix returns to normal. Few are aware. The enslaved minds of humanity go on without ever really knowing what has happend. The never realize that have sold their freedom for — as one character says – a “good steak”. Try as I may in the weeks following Aaron’s death, I can’t shake this image. In this grotesque parody that plays in my head, Neo lies smashed on the ground, Agent Smith grins coldly and Morpheus looks on in stunned defeat. I realize how geeky it must seem. I also realize that to some, it might seem disrespectful. Others would wonder why a grown man in his late 50’s could be talking about a movie as if it has some greater more cosmic significance. Except it’s not just a story. Love the film or hate the film, the underlying story is as the great critic Northrop Frye would have said, an archetype. It’s a semi-mythic tale that resonates in our very core. It does this because underneath the story is a fundamental truth about the nature of our own human story. It is, admittedly, a new age archetype – one born of the last 600 hundred years. It arose with the invention of movable type and the inevitable democratization of information. It is a story about the epic battle between those who held power over what was known and those who fought to challenge that authority. I call it an epic battle because it was. It was not simply an intellectual argument. When mass printing and distribution became possible, those who would seek to hold power recognized the dangers immediately and viscerally. The first to recognize the threat was the Church in Europe. In 1559, the Roman Catholic Church published the Index Librorum Prohibitorum (List of Prohibited Books). The Church wanted to make illegal the distribution of information it regarded as heretical. The Church acted within its accepted authority and prohibited any publication of information without its express approval. It “owned” the rights to information in that age. To use them without permission was illegal. The penalty for publishing without legal permission was severe. Excommunication, arrest and even at times, a horrible death. Others in power soon realized the dangers. Heads of state, who ruled under the idea of the “divine right of kings” were also threatened by these radical ideas. Even the birthplace of English democracy, the Parliament of Britain exerted its control over information. Nothing could not be published without it’s license — so it too could control what information was made public. And with their legal sanction, they fought the release of information that, in the hands of the ordinary man or woman would certainly lead to the destruction of society as it was. They hid the works of Copernicus and Galileo – who tried to spread the heresy that the earth revolved around the sun. Emmanuel Kant was banned from writing on religious subjects because he dared question the supernatural aspects of Christianity. A host of ideas that would challenge the world view – Descartes, Pascal, Voltaire, Rousseau, Hugo, Dumas and of course, the ideas of Locke and and others who inspired that sentence that rocked the Empire — the ultimate heresy — the idea that “all men are created equal”. Some brave souls defied the laws. They had the courage to insist that ideas could not be owned or controlled by those in power even if they power they wielded was the legal sanctions of the church and state. To them, there was a higher power, an authority with a truth that was “self-evident”. Information must be free. Thank heaven for these radicals and revolutionaries Without them our freedom, our ideas of democracy would have withered. Our freedoms are built on the courage of those who defied laws and spoke truth to power. They showed the world for what it truly was. The ideas of Locke found their way into the Declaration of Independence. Martin Luther reformed a Church that even believers admit was corrupt. Others challenged another right of “property”. They aided and abetted slaves who fled into freedom. It took centuries but the collapse of the Matrix 1.0 was inevitable as it cascaded onwards from the enlightenment of Europe. It was a power of truth that could not restrained. It was given voice in printed works surreptitiously distributed over centuries. It was given voice in the oration of Martin Luther King. It rang out its message in the music of Pete Seeger, Joan Baez, John Lennon and so many others in the 1960’s. The unifying factor is that all of these were at one point, pursued by those who held the power of law. We forget now that each one defied the power of the state and some risked everything to do so. Today, it is safe to say, all of these people and more are regarded not as criminals, but as heroes. How could it be a crime to reveal the truth. So it was in the Matrix. Neo — the chosen one — is “corrupted” by a group of “freedom fighters”. He is shaken from his complacency and follows a group who seek to release people from being enslaved by the program known as “the Matrix”. How do they do it? Knowledge. They expose the false reality for what it is. Freedom has a heavy price, however. The comforts that are offered in the matrix – food, home and a relatively comfortable existence – all of these are an illusion, but a comforting one. It may be a lie, but it has a social order. Outside the Matrix, life is real but it is far from comfortable. Those who live outside the Matrix must give up its advantages. They live as ascetics. They are continually in danger of pursuit and capture. The system must stamp them out before their ideas can corrupt others. That’s the story of the Matrix. It’s an archetype. No matter how much you love or hate Keanu Reaves, whether you love the movie or loathe, even if you haven’t seen it, it’s still an archetypal story. It’s the story that began centuries ago told in the fable of Neo who comes to see the world as it is and fights to reveal that truth to the world. But this now, this is real life. It’s not a movie even though it plays out on the electronic circus so reminiscent of the Matrix and no doubt the network that inspired the movie. It’s the story of the real life Aaron Swartz. He too broke free and whether you love him or loathe him, he fought to break the power of those who control information in our world. He too was hounded and hunted and threatened. Eerily similar. Only in this version, they killed Neo. 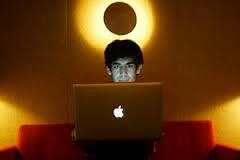 Aaron Swartz took his own life — at the age of 26. Weeks later, his eyes still haunt me. Rest in peace, Aaron. We can only hope that in the spirit of your sacrifice others will also see those haunting eyes. They will see the light so tragically snuffed out so early. Maybe someone else will question why. Why is it that when madmen shoot children we can’t ban guns – the state is powerless. But when a young man commits the crime of revealing information the power of the state is brought to bear to crush him? Maybe, just maybe, some new Neo out there will see it not as a defeat, but as a challenge. Or maybe we won’t need a saviour. Maybe when we look out the corner of our eyes we’ll see for ourselves the illusions that restrain us. If so, your loss will still be tragic and epic. It just won’t be in vain.